How do I ship my item(s) to TechPayout? After receiving the quotes on your item(s) and completing the checkout process, you will receive an email with a prepaid UPS Ground label. (Please check your spam inbox if you do not receive this email) Simply print the label, pack the items, and mail it to us. You can send your items from any UPS dropoff location. It is always safest to hand deliver your item to a UPS store or driver. Make sure to ask for a receipt. We pay all shipping! Click here to find the closest UPS location or drop off. The quoted price and the shipping label are valid for 30 days. If your order goes past 30 days before you are ready to ship your item, you will need to check out again on the site with the current pricing. How many items can I ship to TechPayout? You can ship as many items as needed. TechPayout gives you the ability to add quantities and various models to your quote. Simply add the items you would like to sell or donate, and we will pay the shipping. Can I ship from outside of the US? 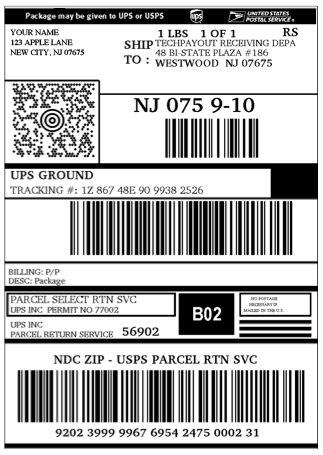 After you complete your transaction with TechPayout, you will receive a prepaid shipping label. Please print the label with your personal printer. If for some reason you are not able to print the label at the end of the transaction, you will also receive an email confirmation with a link to print the label. Check your Spam folder if you do not receive confirmation immediately after completion. If you do not have a printer, you can typically find a printer in the following places: Public Library, UPS Shipping Store, FedEx Shipping Store, Kinkos or Mail Boxes Etc. If you do not have the ability to print your label, please contact info@techpayout.com and include your order number and request. We will mail you the shipping label free of charge. After you have printed the free shipping label, you will need to pack the item(s) in a box. You can use any box of your choice when shipping to TechPayout. We always pay shipping. If possible, use a new box. This will provide maximum protection to the item(s) inside. If you reuse a box, please make sure it is secure, and taped thoroughly to ensure the items(s) protection. - Cover all previous labels and bar codes. 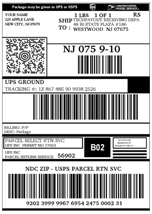 - Use a permanent black (or dark colored) marker to completely black out all bar codes and labels on the box. If the item(s) are small enough, you may use a padded envelope. Please wrap the item in bubble wrap to ensure the items(s) protection. It is important to secure the contents of your package properly. Electronics are fragile, and we do not want the items to be damaged during shipment. Please be sure that you wrap each item separately. Proper closure of your container is just as important as proper cushioning for the safety and security of your shipment. Apply three strips of tape to both the top and bottom flaps of the box. Please ensure that the box is secure and ready to ship.